Making kids smile is what he does best. 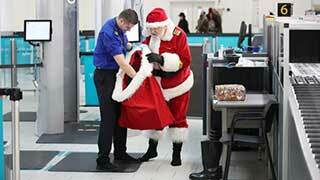 Sorry Santa, but there are no exceptions when it comes to airport security. Santa Claus – at least a reasonable facsimile -- was stopped by airport security at LGW as staff inspected his sack of presents before he was allowed to make his maiden flight on board an easyJet Airbus A320. Santa, of course, is a pilot himself, who has clocked up hundreds of thousands of air miles and been flying for over 1,700 years. According to EasyJet, the jolly old man is taking off earlier than scheduled this year to meet 20,000 passengers in advance of Christmas Day. 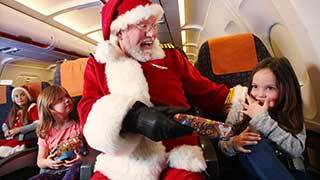 More than 100 easyJet flights across Europe over the festive period will see lucky children get a surprise from Father Christmas. To celebrate the launch of the new festive themed flights easyJet surprised and delighted children and families on board a flight to Europe. Tina Milton, head of cabin crew, easyJet said: "We fly millions of people home or on holiday over the Christmas period and we want to get the festive feeling started on board. "We have hired the world's most famous pilot to fly on over 100 selected flights and give over 20,000 passengers an incredible surprise."